Carmeco Inc., Lebanon, MO, was founded in 1970 as a 6000-sq.-ft. metalforming company with a handful of stamping presses. From its modest beginning, the firm has evolved into a full-service contract manufacturer with 80,000 sq. ft. of manufacturing space over two buildings. Its customer base includes OEMs in the trucking, housing, agriculture, recreation and other industries. 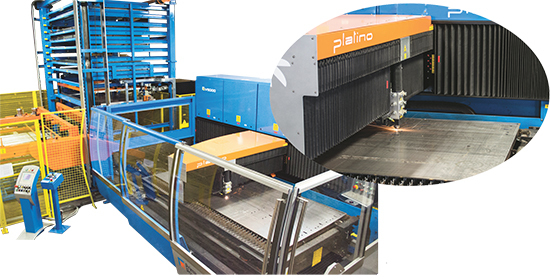 Carmeco’s new laser-cutting cell includes Prima Power’s compact 10-shelf TowerServer material-handling system that allows easy loading/unloading of blanks and processed sheets. It has an elevator for loading and unloading the pallets on and off the tower, and features single-sheet separating. Now with a stamping-press count of 22, the metalformer also employs press brakes to 110-ton capacity, as well as a slew of arc- and resistance-welding equipment. Its latest evolutionary step came in April 2013, with the investment in a high-power laser-cutting machine. Carmeco’s laser-cutting machine, a Prima Power Platino model 1530 with a 60- by 120-in. table and 5000-W CO2 resonator, cuts a broad range of materials and thicknesses with speed and precision, without the need for manual adjustments. The cutting head gives users a choice of a 10-in. focal length in addition to the standard 5- and 7.5-in. lenses. The 10-in. lens enhances application flexibility by increasing the depth of focus and enlarging the spot diameter for high and uniform cut quality of thick stainless (5⁄8 in. ), aluminum (1⁄2 in.) and mild steel (1 in). Offering a compact footprint along with a Cartesian cantilever structure that provides three-sided access, the machine has proven easy to operate and quick to program, says John Carr, Carmeco vice president of business development. Its unique stonecast frame reportedly reduces vibration and increases stiffness compared to cast iron and welded frames. And, its low heat conductivity results in high thermal stability compared to traditional cast or steel frames. The 5000-W laser-cutting machine carves up mild steel to 1 in. thick, stainless steel to 5/8 in. and aluminum to 1/2 in. For the past several years, Carmeco’s customer needs have been changing. “Today, we perform an increasing amount of complete manufacturing services, from raw material to welding, painting, assembly and shipping,” explains Carr. “This led us more and more to invest in laser cutting. We see an increasing amount of assembly work and smaller-piece runs where stamping is not the most efficient production method. According to Carr, Carmeco spent several years researching the latest laser technology and talking to numerous builders. Carr expresses appreciation for several of the Platino’s features, including the cantilever arm, user-friendly software, one-piece stonecast construction, and the flexible automation—Prima Power’s compact 10-shelf TowerServer material-handling system, which allows easy loading/unloading of blanks and processed sheets. It has an elevator for loading and unloading the pallets on and off the tower, and features single-sheet separating. Carmeco has 48 employees that work 10-hr. shifts, four days/week. Initially, the Platino ran four 10-hr. shifts per day, but now runs lights out, clocking 18-hr. workdays. Carr also notes quantifiable returns on the cutting-machine investment resulting from the cut-edge quality the laser provides. The Platino also has replaced most of the shearing that used to occur at Carmeco.